It marks the networks' locations on a map. Facebook has started testing a feature that will help you find the nearest public WiFi networks you can access for free. TheNextWeb has spotted the experimental feature in the iOS app, where chosen users can toggle on "Find WiFi" in their menus. The social network's spokesperson confirmed its existence to VentureBeat, explaining that the company has begun rolling out a "new feature that surfaces open WiFi networks associated with nearby places" in order "to help people stay connected to the friends and experiences they care about." 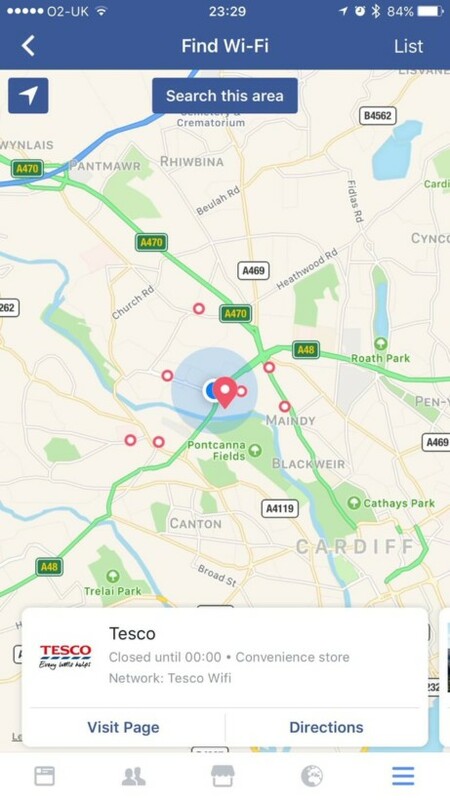 Once you've switched on the feature, the Facebook app will automatically detect places with free WiFi near your location and mark them on a map. It will even list the location's business hours, its nature and WiFi name, so you know you're not connecting to the wrong network. As TNW mentioned, the feature seems like an obvious move for a company that's promoting its ability to broadcast live videos. But it sounds a lot more useful for developing nations where a lot of people don't have mobile data subscriptions.